I would hope that in whatever form it comes that it will be significantly cheaper. The future of education is probably more self-directed, more varied. The idea that we should all go to the same place, follow the same general curriculum and pay the same amount? It’s insane to me. I feel like my education began when I left school for precisely this reason. 3. What are the 5 most important principles of Philosophy/Stoicism that have changed your worldview? 1. The only things that matter are the things that are inside our control. 2. Virtue and excellence are the things each individual should aspire to. 3. That indifference is not a weakness but a strength. 4. That posthumous fame is worthless. 5. That we are only entitled to our efforts, not the results of those efforts. 4. Where does your work (and specifically the work of Philosophy) belong in the current education system? At the core of it — but practical philosophy, not academic or theoretical philosophy. I am interested in the kind of philosophy that makes for better people, better soldiers, better thinkers. Not the kind of intellectual jacking off that most people associate with philosophy. In a world where religion is in decline, philosophy becomes more essential because it shows us how to live life and how to be good. Well, Stoicism is what you do. It’s what you do on an airplane that’s three hours delayed and you have a meeting to get to and you’re stressed out. It’s what you do at your mother’s deathbed. It’s what you do in the mornings when you journal about the day ahead. It’s not something you learn once, that you memorize from a book. It’s a practice. 6. Who is one historical or public figure (alive or dead) that you admire and why? Obviously many. It’s hard not to think about Lincoln these days, as his patience, poise, strength and grace are so clearly lacking. He was also the opposite of most of our leaders today: Self-made. Self-taught. Incredibly intelligent yet always practical. And then he was driven by a larger purpose or vision too. Right man, right place. 7. What is the greatest problem facing our world today and what is one way you think we could solve it? I don’t pretend to know the answer to this. There are clearly many many problems, each of which probably has a case for why it is more important than any other. It does strike me as particularly alarming that we can’t even agree on what’s “good” anymore. Nazi’s marching in the street and it’s not universally condemned. But then on the other side, we tear down the Confederate monuments but there’s no way we could ever agree on who we should hold up as exemplars in their place. 8. 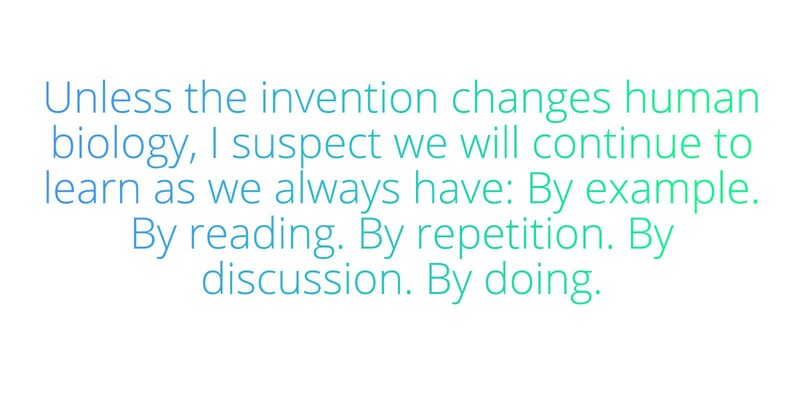 What invention is going to change the way we learn? Did the internet really change how we learn? Isn’t Wikipedia just a more expansive version of older encyclopedias? Unless the invention changes human biology, I suspect we will continue to learn as we always have: By example. By reading. By repetition. By discussion. By doing. 9. What is “The Perennial Seller?” & What should the world know about your new book? Perennial Seller is just a book that celebrates a certain kind of creative work that I think is underrated and understudied — the kind of work that lasts. I’m not interested in being on the bestseller lists at the week of release (though I have done that). I want to make work that is selling best many years down the road, that’s still relevant and working for people. And I suspect most creators agree. Problem is they make a lot of choices in conflict with that belief. The book hopefully provides a better path.